Join the discussion on our forums! Come discuss Obsidian Shard over in our dedicated Obsidian Shard discussion topic. "Costs (1) less for each card you've played from another class this game." For the sake of consistency, and ease of understanding for new players. Cards such as Bolvar Fordragon clarify that their continuous effects only trigger in hand, while Arcane Giant includes the "this game" clause, as that's what it does. Due to Obsidian Shard behaving more like Arcane Giant (in that it keeps track of how many "another class" class are played that game, without being in-hand,) it having just two more words would add much more clarity overall. Seeing as you just made your account, I guess you wouldn't know. The parenthesis indicate the period for HS. "Triggered" was the time frame before "Marin's Treasure." Flame Elemental cries in a corner. WIth the proper Thief Rogue, I can see this working proficiently. Swashburglar and Undercity Huckster are a couple of good ways to get alternative class cards. Will this keep the mana reduction if your Molten Blade transform into it and you play non-warrior cards? Most likely no because it states that it's the one that costs (1) less. After watching a video, I found out that Shifter Zerus keeps the mana reduction from Emperor Thaurissan and cards like Knight of the Wild. If Molten Blade is coded the same, then I guess it will keep the mana reduction. I think I see what you mean, which video though? Thaurissan and KotW trigger at certain times to grant indefinite-duration enchantments "attached" to the card in hand. Shifter Zerus and Molten Blade keep these enchantments once the card's identity shifts away to something else. 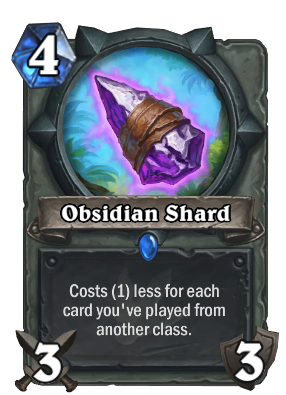 Obsidian Shard is like the Giants - the ongoing ability built into the card itself is responsible for changing the mana cost. Once the card shifts, it no longer has that ability, so the mana cost reduction goes away. Not so good in mirror matchups. Another weapon for Rogue that will see no play. It's too inconsistent, some cards you burgle will be unplayable/too expensive. Unless you get it to 0-1 mana is it even that good? Spirit Claws is now a 2 mana 3/3 and sees 0 play. You wouldn't be able to utilize this until the late game, but how useful is a 3 attack weapon on turns 8-10? You might as well play Deadly Poison. Again it looks like Rogue got shafted. Spirit claws sees no play because it has three attack only about 25% of the time. It was played at one mana, because a 1/3 weapon with a small chance of a bonus damage is good. at two mana, you're better off playing it safe for 2 attack with the other 2 mana weapons. Almost every rogue already play Swashburglar. So I think this weapon is playable. I love playing a stealing rogue. This fit's in that deck nicely.